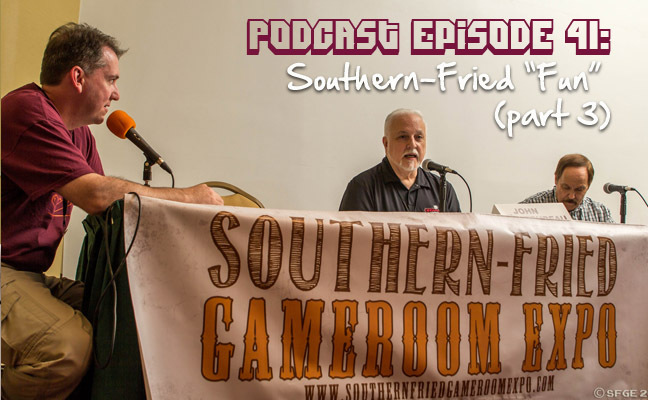 In this third and final installment focused on all the fun had at the Southern-Fried Gameroom Expo, we discuss the final day of the show. At the end of the episode we provide an interview with two legendary pinball designers, Barry Oursler and John Trudeau. In addition to the wonderful interview of the designers of Space Shuttle, Pinbot, Congo, and Creature, we do take some time and go over current gameroom updates, a brief trip report, and even unveil a special song written just for us. Lastly, we stretch our wings a bit and try a new segment where we design a gameroom around a perfect theme. We hope you enjoy episode…wait for it…FORTY ONE!